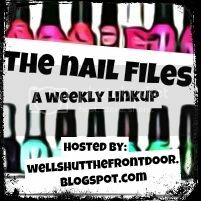 This week, I was all about the simple mani. Call it laziness if you will but sometimes, a gal's just gotta be fast and easy, right? Wait...why does that look bad now that I read it back? Haha! Lack of eloquence aside, I'm sure you get what I'm saying. I used exactly two polishes for this mani, both by Finger Paints: Paper Mache and Black Expressionism, and two makeup sponges (one for each hand). I did one coat of white to start, and then two coats of gradient black and white on top. Then, I did a coat of Seche Vite, went to sleep, and peeled off the polish in the morning when I was in the shower. Haha! No, it wasn't the classiest of moves but the mani turned out great! After the polish was gone from my skin, I cleaned up my cuticles with some nail polish remover and a brush. This was my first time doing a gradient with the darker colour on the bottom and I've gotta say that I dig it! It didn't take long (sleep time, aside, haha) and it's definitely a look that I'll do again. And hey! 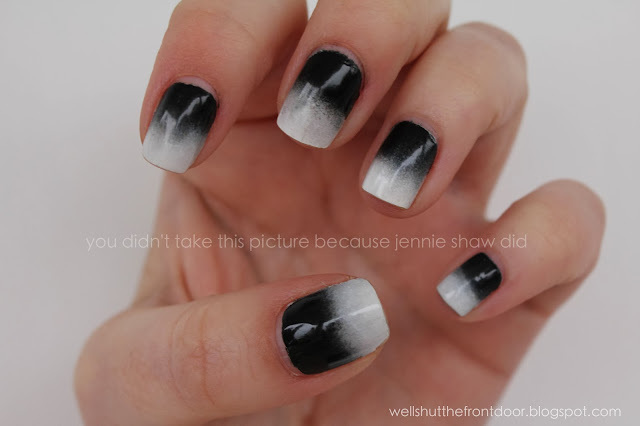 If you're scared of doing a gradient, don't be! I did a little video tutorial that breaks it all down (plus you get to see how awesome I am "in person" - haha!) so click here to see that post. Happy weekend everyone! And an especially happy Thanksgiving Weekend to my Canadian peeps! Tres cool. I have nothing to link up, but I did buy two new colors yesterday: mistress and drama. Made me wonder about my frame of mind. Black & white are so pretty together. Oooh I love this look Jennie! It's like a classy goth look. And we both did makeup sponge looks this week :) #GreatMinds. Have a great Thanksgiving this weekend!! I've been invited to a Thanksgiving party so I think I'll do some celebrating too! haha You have such a great humor! Jennie.. I missed you!!!! I'm thinking up this week. This mani rocks and how cool for Halloween as well. I hope to someday master the gradient look. I dig this black and white gradient too! <3 Looks so classy! Perfect for Halloween too. Wow, that looks great! I will have to check out your video because I am clueless about how to do this. I'm not sure what you peeled off, but it looks amazing! Love it! I saw an orange and black gradient on Pinterest yesterday and loved it. ;) Thanks for hosting!